Remove bearing if present. Brush off loose dust etc. with an old toothbrush or similar. Remove resinous deposits with a solvent. Far and away the best solvent I have come across is contact adhesive remover. Use in well ventilated conditions. After cleaning, spray with any handy spray e.g. 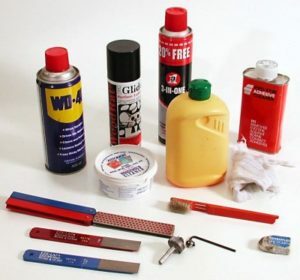 WD40, Silicone etc. then replace the bearing. Lubricate the bearing with spray oil, but never use WD40 on bearings. The first time you remove a bearing from a bearing-guided cutter you are likely to find that the Allen screw is really tight. It is easy to remove a lump of your finger if you are not careful. I keep an old gardening glove in the workshop and put it on to hold the cutter if the bearing is tight. Keeping cutters sharp with a diamond hone will improve your work, increase cutter life, and extend the periods between re-sharpening. Use a thin diamond hone of ‘Fine’ or ‘Superfine’ grade. Keep the hone well wetted, and rub the flats of the blade back and forth. Heavy pressure is not needed – let the diamond do the work. Give the same number of strokes to each edge to preserve the balance of the cutter. Try about ten strokes to each edge to start with. Experience will teach you how many for a given cutter. Remember it is a honing operation not a grinding one. A good analogy is the old-fashioned barber and his razor. 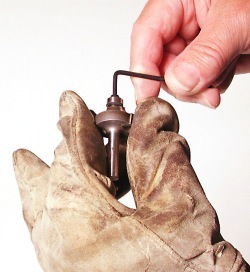 If honing immediately after cleaning, do not spray until honing is completed. Cutters with shanks bigger in diameter than the cut diameter cannot be easily honed. The most common examples are 1/4in and 3/8in cutters on 1/2in shanks. If you have a 1/2in router it pays to have at least one each of the smaller diameter cutters on a 1/4in shank, so that you will be able to keep them sharp with your hone. 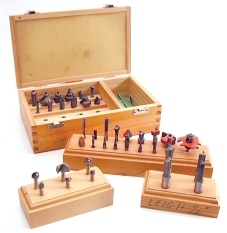 Having cleaned and honed your cutters, do not spoil things by throwing them loose into and old box or tin. If the original packaging is lost or inadequate, keep cutters in blocks of wood drilled to take their shanks. Use softwood or well-seasoned mild hardwood (not oak) to avoid corroding the shanks, and drill a clearance size hole to prevent the shanks jamming in the block. For 1/4in cutters I use a 17/64in twist drill, for 8mm cutters a 21/64in drill and for 1/2in cutters a 13mm drill.